Since the year 2009, Shree Aniruddha Upasana Foundation along with Bharatiya Bhasha Sangam and Shree Aniruddha’s House of Friends has been celebrating Maghi Ganesh Utsav on Shuddha (Shukla) Chaturthi in the month of Magh(a month in Hindu calendar). 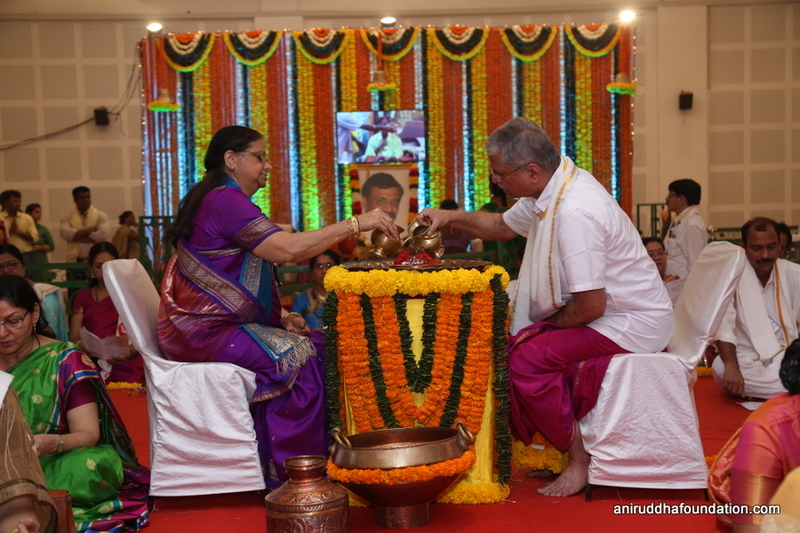 On the day of Maghi Ganesh Chaturthi, the-‘Shree Ganesh-PratishthaYaag’, a one-day ritual, as per the Vedic tradition is being organized, under the guidance of Sadguru Shree Aniruddha. ‘Lord Ganapati’ governs the ‘Mooladhar Chakra’, one of the Saptchakras(seven chakras or power points) located in a human body. The original form of the Ganapati is called ‘Brahmanaspati’. The Rigvedas describe Lord Ganapati as “Brahmanaspati”. Brahmanaspati is the son of Goddess Shivagangagauri (a form of Parvati) and Lord Kiratrudra (a form of Shiva), on the other hand, Ganapati is the son of Lord Shiva and Goddess Parvati. ‘Ghanapraan’ is the “KaryaShakti” (i.e. the active energy) created in the human body in three forms, viz. mind, soul and intellect by the use of “Dravya Shakti”. This “Karya Shakti” or ‘Ghanapraan’ is called “Ganapati”. The “Ghanpraan” means the “Karyashakti” (Active Energy) produced on the gross level, created through Dravya Shakti present in Trividha deha (mind, soul and intellect) as well as in nature. Modak – Modak symbolizes Lord Ganapati’s influence over the centre – Aahar (Intake). Modak represents the medium that keeps a check on all our intakes and ensures only good reach us. Intake here implies food as well as thoughts we absorb through a mind. Dant (Tooth) – Dant represents Ganpati’s influence on the centre of Vihar (Wandering ). A man’s mind wanders, intelligence travels, physical body and prana observes time and speed; as a result, we experience happiness and sorrow. Dant teaches to get rid of unwanted thoughts and reduces mind-wandering. Pash(Noose) – Paash means noose. Paash is used for controlling our conduct. Hence, ‘Paash’ represents Ganapati’s influence on the centre– of Conduct (Achar). Parshu (Axe) – Parshu (Axe) is said to give right direction to one’s thoughts. It represents Ganapati’s influence over the centre – Thought (Vichar). 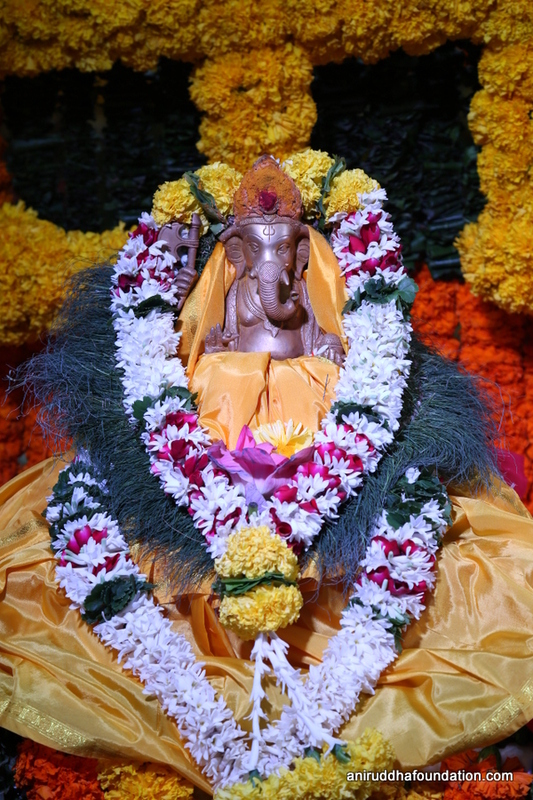 It is the blessings from Aadimata Anasuya, another form of Mother Chandika that has endowed Lord Ganapati with all the powers and controls. This very Leela (pastime) makes this Mangalmurti Ganesh, who is the Ghanapraan of the universe the Vighnaharta (i.e. destroyer of all hurdles. 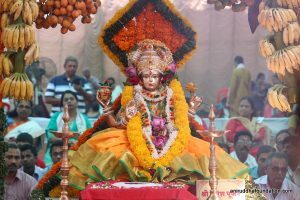 To help attain man the success and yield overall progress in the material world, Parvati Mata, following the command from Adimata Anasuya, created the universe’s Ghanapran as Her son. The detailed story appears in the holy grantha, Matruvatsalyavindanam, written by Sadguru Shri Aniruddha. The day when the Ghanapran was brought to life was the Magh Shuddha Chaturthi (fourth day of that month after new moon) day of the Magh month. Hence, this day is celebrated as the Maghi Ganesh festival. 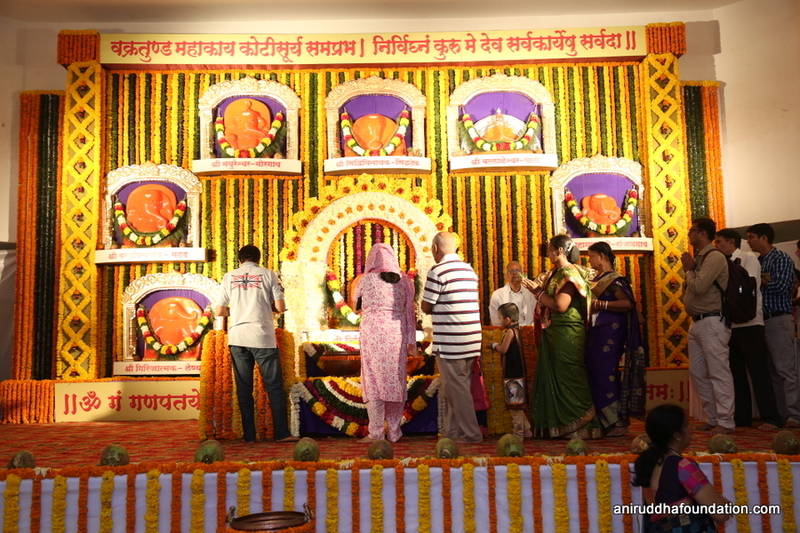 Idols similar to the ones present in each of the original locations of the Ashtavinayak are placed in this Utsav. 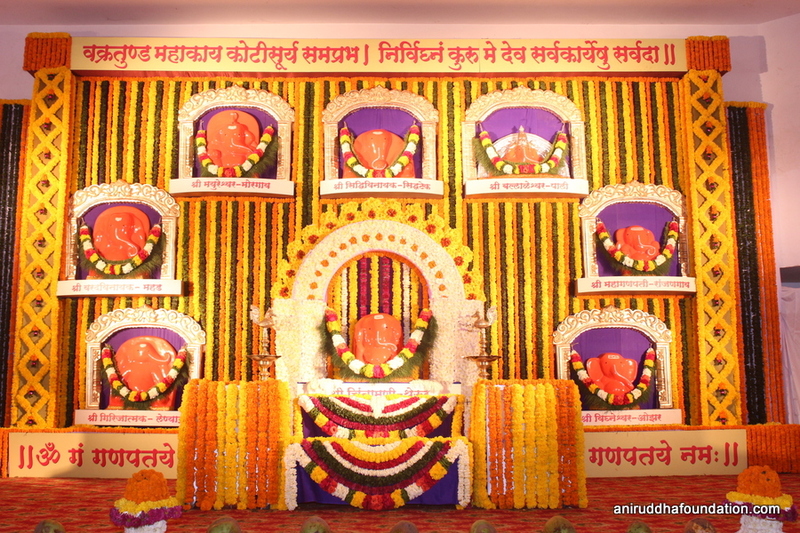 Every Shraddhavan can offer durva and flowers to Brahmanaspati and Ashtavinayak. The Ganpati Atharvashirsha is chanted continuously 108 times from 4 in the evening to 9:45 at night. 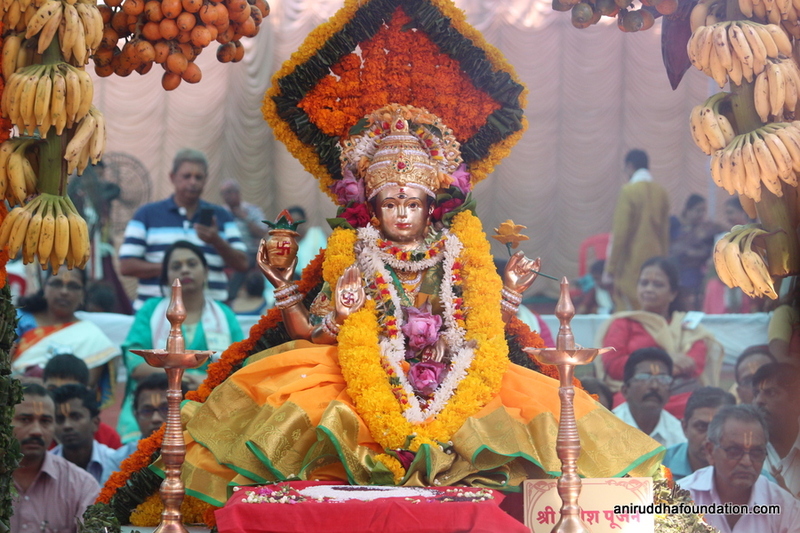 Shraddhavans can participate in the chanting of Brahamanspati’s mantra and Atharvashirsha. Brahmanspati is the son of Mata Shivagangagauri, the Shodashopchar pujan and archan of Shivagangagauri are carried with the Vedic mantra, along with Shree Ganesh Pratishtha Yaag. Also, the 108 names of Shivagangagauri are chanted too continuously, and Haridra (holy turmeric) is offered to Shivangangagauri. Shraddhavans rid themselves of their perils with the darshan of Shree Brahmanaspati and Ashtavinayak, and their life becomes prosperous by the grace of Sadguru. In this way, the Shraddhavans religiously celebrate Shree Maaghi Ganesh Utsav every year.